Here are some examples of yt in the real world. We welcome you to submit your own images made with yt from publications, talks, webpages, etc. Just fork our repository and issue a pull request with your image at the top of the page. Images should be about 400 pixels wide, and please include a link to any published work. In O'Connor & Couch (2018), the authors used yt for the visualization of their data. 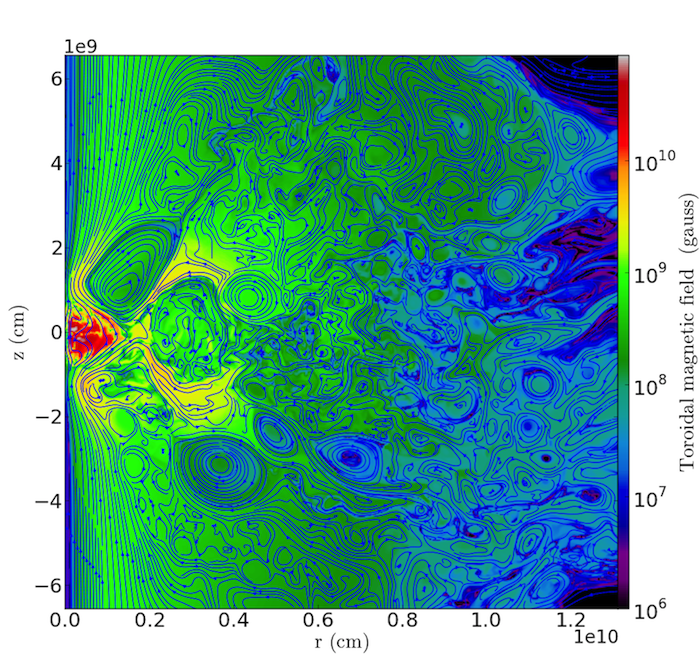 This figure, a volume rendering of entropy near the gain region of a core-collapse supernova, shows the multidimensional hydrodynamic instabilities at work. Both turbulence and the standing accretion shock instability (the spiral wave wrapping around from the left) aid the neutrino mechanism in reviving the stalled shock. In Ruggiero & Lima Neto (2017), the authors used yt to do all the analysis and visualization of their data. This figure shows gas density projections of a Milky Way like galaxy falling into a galaxy cluster with different entry speeds, for the case where the cluster has a cool-core (first three rows) or does not have a cool-core (last three rows). yt has been used to create volumetric renderings of human CT scans in support of the NeuroDome project. For more information, check out the NeuroDome website. This movie was completely scripted in Blender using the AstroBlend python library, freely available artistic 3D galaxy models and yt-generated surfaces of a FLASH simulation. AstroBlend tutorials and examples are available on the AstroBlend website, which is still very much under construction. Paper due out at some point in the (hopefully) near future. This movie was created completely with yt by Matthew Turk, John Wise, Sam Skillman, and Mark SubbaRao that shows a zoom-out of a collapsing metal-free halo and then transitions to another simulation that follows the main sequence and supernova of a metal-free star. The simulation shown in the first half was presented in Turk et al. (2009) and the latter simulation will be published shortly. This visualization won the Best Visualization Award at the XSEDE 13 conference and was exhibited at the Alder Planetarium. 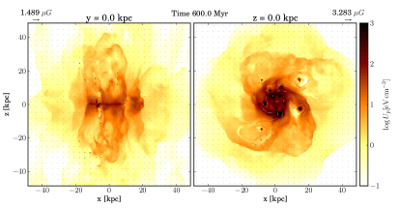 This multi-panel figure, created with the eps_writer extension, highlights the magnitude and direction of the acceleration created by radiation pressure from massive stars in a dwarf galaxy at redshift 8. This simulation was presented in Wise et al. (2012) and conducted with Enzo. The bottom panels show the density, temperature, and metallicity of the same slice. This figure was published in the reference above as Figure 9. 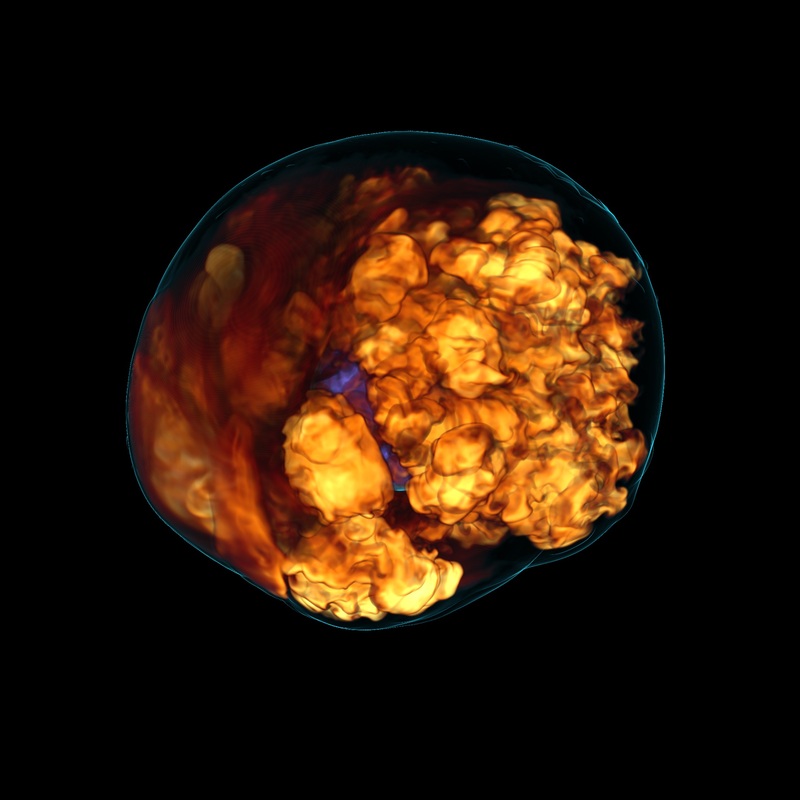 This movie shows the density and temperature structure around a forming protostar that is surrounded by an accretion disk and driving a bipolar outflow. 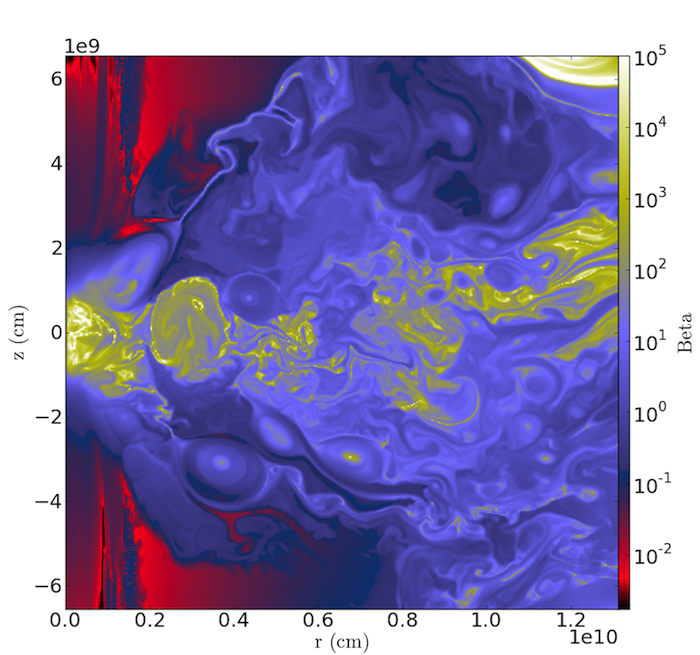 The simulation was carried out by S. Offner with the ORION code, the temperature was computed by T. Robitaille with the Hyperion radiative transfer code and the visualization was produced in Python using yt and matplotlib. Lallement et al. 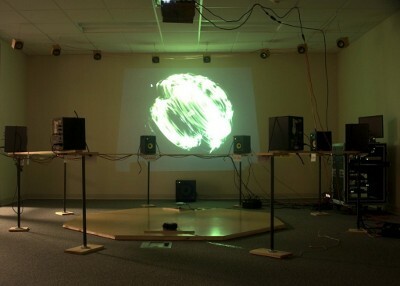 2013 used yt to extract surfaces from maps of the local interstellar medium to create interactive figures. 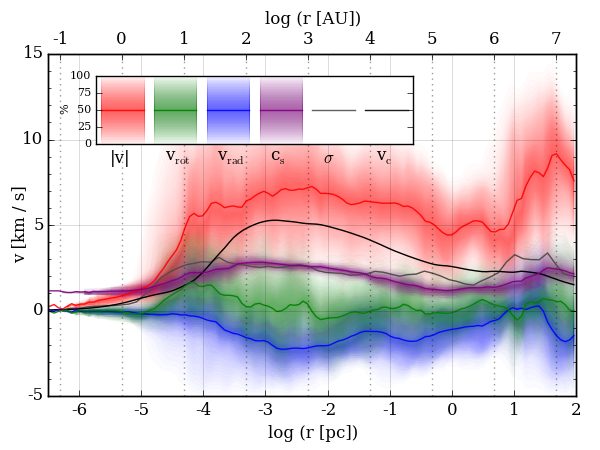 These figures can be viewed either in the PDFs on the arXiv, or on Sketchfab. Threshold 0.004 and Threshold 0.00007. Figure 1(c) and 1(d) from Ji et al. (2013). Two frames in the r-z plane of cylindrical coordinate consisting of: Left) magnetic field, with lines of poloidal magnetic field in the r-z plane superposed against a color raster plot of the toroidal field; Right) the ratio of gas pressure to magnetic pressure β value. Figures generated with the yt slice plot. 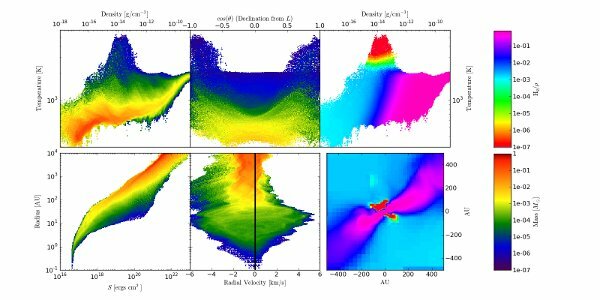 A slice through the z-plane of a typical cloud from Benincasa et al. 2013. Image size is 300 pc, overlaid with vectors indicating local gas velocity and contours at number density of 100 cm^-3, indicating identified GMCs. Figure 10 from Smith et al. (2015). Radial profiles of the various components of the velocity field of a collapsing, metal-enriched gas-cloud. 2D profiles made with the yt halo analysis toolkit and image made with matplotlib. 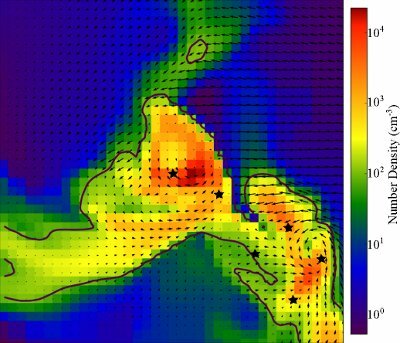 yt has been used by researchers with the Seismic Sound Lab at the Lamont-Doherty Earth Observatory to create public outreach movies of earthquake simulations, which have been coordinated to match sonification of these simulations. Figure 1b from Hanasz et al. (2013). 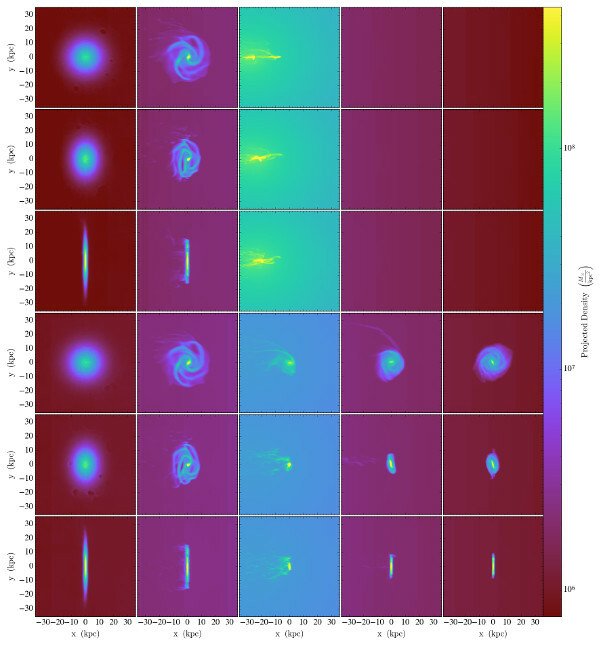 Vertical (left panel) and horizontal slices (right panel) through the computational volume from the simulation of the cosmic ray driven outflows in gas-rich, high-redshift galaxies showing electron energy density. Data extracted using yt and visualized with matplotlib. 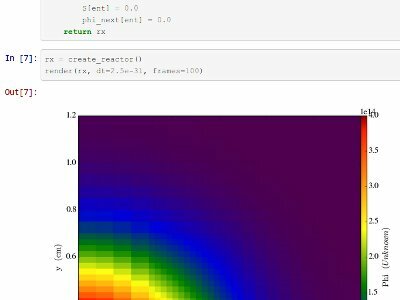 This notebook demonstrates construction of a simple neutron diffusion problem, using PyNE, yt, and the IPython notebook to solve and visualize the system in-memory. It constructs a semi-structured mesh in memory and then over the course of several timesteps updates the values and plots. 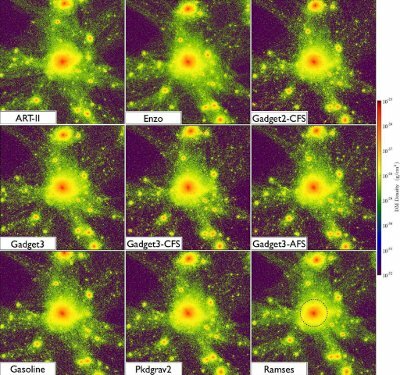 The AGORA project is a suite of galaxy simulations conducted with multiple codes. The figures in Kim et al. 2013 were created with yt from data generated by many different simulation platforms, with scripts available in a publicly accessible repository. This figure, from Turk et al. 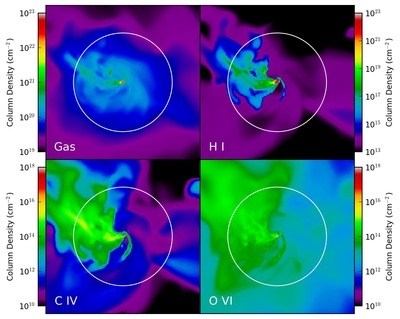 2010, demonstrates using yt to construct derived fields for examining local angular momentum, entropy, and the distribution of molecular gas in protostellar disks. Figure 1 from Hummels et al. 2013 displays views of a galactic halo through synthetic observations of its circumgalactic medium in different ions. It uses yt to generate off-axis line integrals for computing the equilibrium metal abundances at every point along the line of sight and coadds these to produce a series of column density maps. In Richardson et al. 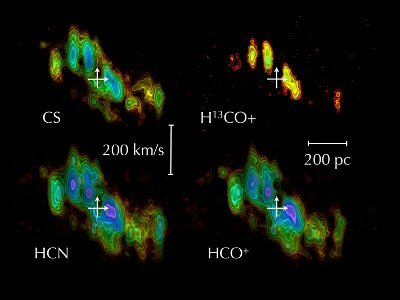 2013, the authors studied the interaction between metal-enriched outflows and cosmological minihalos to examine the formation of clumps of dense, chemically-homogeneous star-forming gas.